When you are trying to find your way through the wizarding world, one of the first steps which will remain with you all your life is the choice of the right wand. Everyone who grew up among wizards knows that it isn’t so much a choice as a response… the wand chooses you, of course. But, there are a few things that we can do to help tip the odds. Be prepared. Make sure that you are thinking carefully about the direction you want to go with your future magical use. And, above all, do not touch anything. We promise: everything is a monster. Ha! The wand has already responded and you are in luck This wand belonged to one of the most skilled and intelligent of all wizards in Hogwartz history. Bestowed upon you is Hermione’s Wand. 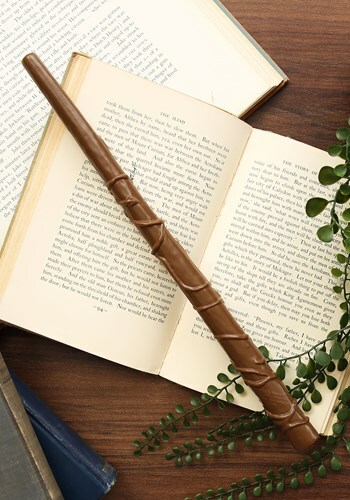 This 15” long wand not only contains a dragon heartstring core and features intricately carved vines and leaves around its exterior, but it is also officially licensed. We’re not sure how that augments the magic you can incant with it, but we’re sure it has a lasting impact. Go, now, and Accio Wand!